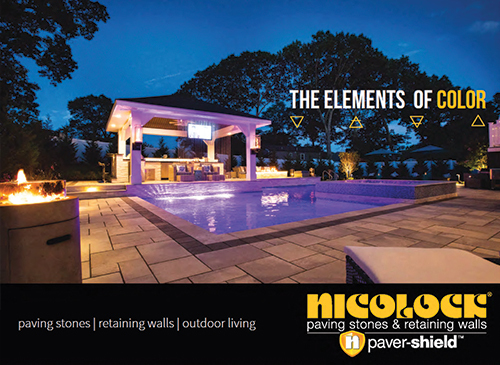 Nicolock manufactures a complete line of interlocking concrete paving stones featuring their exclusive patented Paver-Shield (R) protection, architectural paving slabs, wet-cast concrete products, segmental retaining wall systems as well as a full line of environmental pavers. Technological advances, select materials and rigorous quality-control guarantee product consistency. Not only does Nicolock offer the best in color technology and selection, but they continue to exceed the standards set by the Interlocking Concrete Pavement Institute (ICPI) and the American Society of Testing Materials (ASTM) PLUS, all Nicolock pavers are backed by a transferrable limited lifetime guarantee! Unlike many manufacturers that only produce dull, drab shades of brown and gray, Nicolock offers everything from simple monochromatic colors to complex multi-color blends. If you are looking for vibrant colors that will last for years to come, then look no further! Talk to someone at Century Building Supply today!